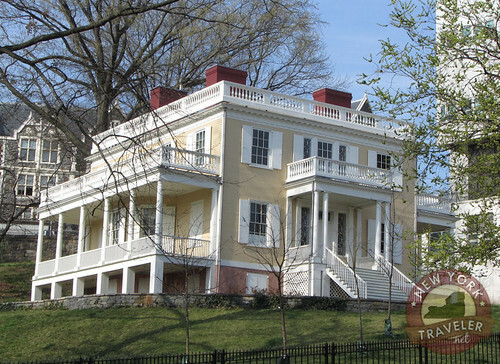 Alexander Hamilton built and owned only one home in his life, The Grange, or his “sweet project,” he called it in his letters. 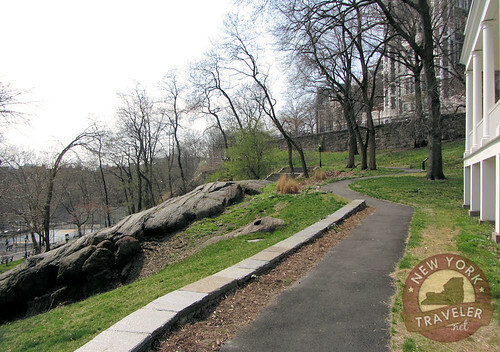 He’d had a tempestuous, tragic life as a young man and was now ready to settle down into comfortable family life in the countryside of Upper Manhattan Island, Harlem Heights. While he was planning and building the house and surrounding property, Hamilton embraced homeownership with typical Hamiltonian zeal and energy. His letters are filled with ecstatic details of his ideas and plans, including a small garden with 13 sweetgum trees, representative of the 13 new states in the newly formed United States of America. 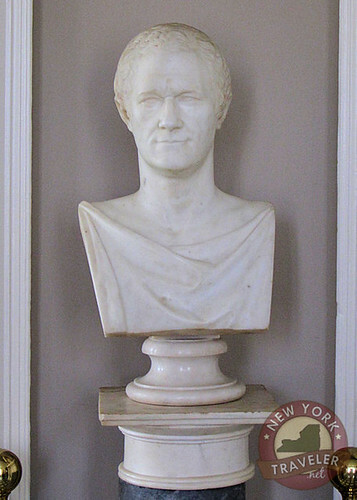 He oversaw every tiny detail, enlisting the architect John McComb, Jr. (architect of New York’s First Home, Gracie Mansion, and New York City Hall). Unfortunately, Hamilton would enjoy only two years at The Grange. His life was tragically cut short in 1804 by Vice President Aaron Burr in the now infamous duel. To add to the tragedy, Hamilton died in debt. His widow, Eliza, and their eight children had no means of support, and Eliza was going to lose her house. Thank God, some friends of Hamilton pooled together, purchased the house and sold it back to Eliza for half the price. The house remained in the family for about three decades when Eliza could no longer keep it up. The house has a number of owners including Samuel Ward, brother of Julia Ward Howe who penned Battle Hymn of the Republic. 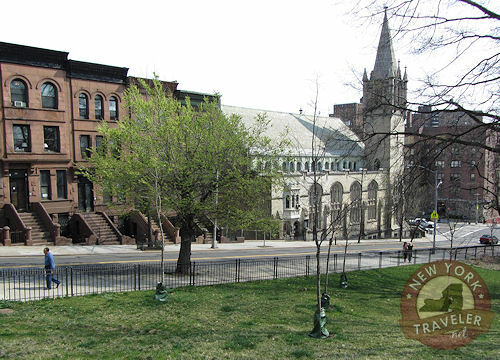 In 1889, the property (with house) was purchased by St. Luke’s Episcopal Church. The church moved 300-ton house — with a team of horses!– to a new location to make room for some rowhouses. The house was used as a chapel for the church. Later, the church built a stone church building next to the house. A developer built a large apartment building on the other side. The Grange was squeezed tightly between the two for many decades. American Scenic and Historic Preservation Society bought the house and converted The Grange into a public museum in 1924. 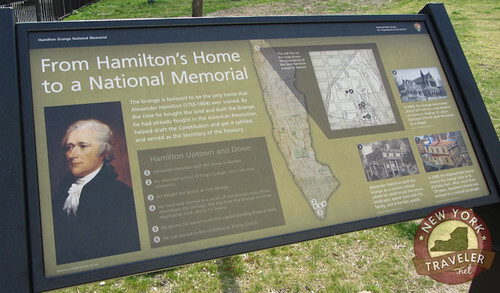 In the 1960s, the house was deemed a National Historic Site and a National Memorial, and a new site was sought to restore the building to the period of 1802 to 1804 when Hamilton would have known it. This leads us to today. It’s been a long wait, but The Grange is finally situated at its permanent location and restored. 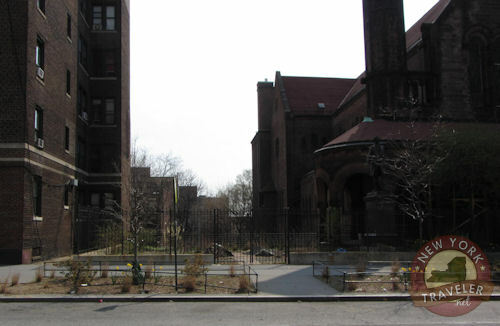 The empty lot where The Grange once stood. The house is lovely. It’s Federal style, a breezy and elegant form of early American architecture descended from the Georgian style. New sweetgum trees have been replanted in the front yard. The yard is beautiful. It has a relaxing, park-like setting. The City of New York University Shephard Hall building looms from behind over the yard. After so long, The Grange has finally found a home. We ventured inside to for a wonderful visit. I’ll have that story in the next post!